A rice cooker was originally designed for cooking rice, but with time it has turned into a multi-functional appliance. Today, it can be used to steam vegetables, cook eggs, soups, and dalia and even make dumplings. It has in fact turned into a versatile cooking appliance and is the perfect mate for those who are too busy and hard pressed for time. The best part of using this appliance is that you don’t need to monitor it. Just press the button and forget about it.It will cook and keep the food warm till you eat. Thus, the cooking process in a rice cooker is easy, efficient and effortless. Here are 4 different rice cookers from Kent that come for less than INR 5000 to make your life easier. Kent Personal Rice Cooker: This model is the perfect companion for bachelors, people who love to travel or have little kids or elderly people at home for whom home cooked food and that too in small quantities is a necessity. It is small and innovative, all of 1.14kg in weight with capacity of 0.9L. It is easy to carry along during your trips and is ideal for making food for a single person. It comes with a price tag of INR 2,700. 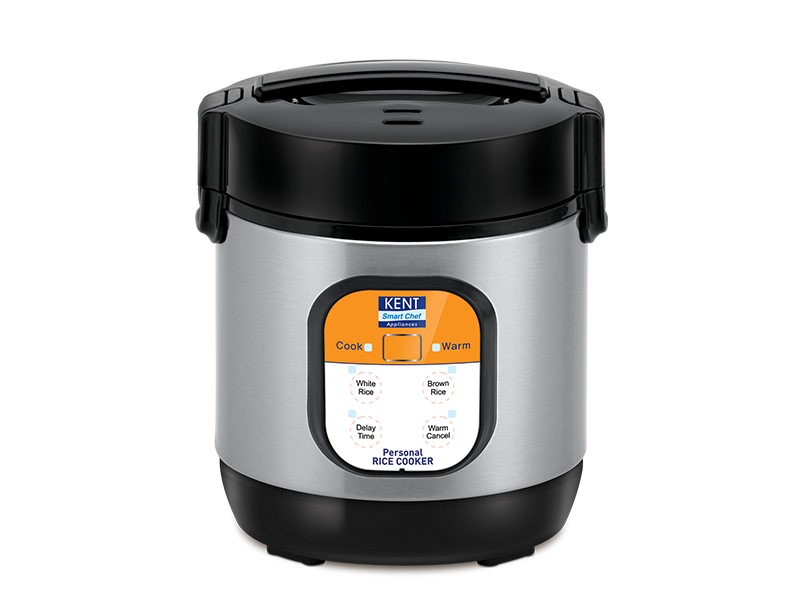 Kent Electric Rice Cooker-3L: This 3L rice cooker is ideal for small families. It comes with advanced induction heating function, which comes handy for adjusting the temperature within a short span of time. It can be used to cook several variants of rice, steam vegetables and also for making soup with its one-touch operation. All of 2.09 kg in weight, this powerful appliance can be owned for INR 3000. Kent Electric Rice Cooker-5L: If you have a big family, you need not worry about cooking and serving everyone warm rice. The ‘Keep Warm’ function of the rice cooker keeps food warm for family members who eat at different times and reduces the hassle of reheating the food. It has a unique cook and serve, design and a perfect grip handle that makes it easy to carry. Add this to your kitchen for a mere INR 3500 and you are all sorted. KENT Electric Rice Cooker SS: Another option with 5L capacity is Kent Electric Rice Cooker SS. With a non-stick ceramic coating, it has the most advanced heating operations. The induction heating technology ensures a better response to temperature change so that you get evenly cooked rice within minutes. The automatic ‘Keep Warm’ function saves you from the hassle of reheating and the appliance is very easy to clean and store. You get complete peace of mind for just INR 3700. If you think that this appliance is only good for making rice, you need to think again. As it happens with any appliance, owning and utilising it efficiently are different ball games altogether. You can buy and keep using it only for making rice or you get creative and utilise the complete potential of this humble appliance. Once you start utilising it completely, you will be amazed at its versatility.